NOTA AICEX: Chi ha mai detto che è sempre meglio avere Feedback positivi ? The Value of Feedback for Retailers & Restaurant Owners. What Helped You More: Negative or Positive Feedback? According to a survey published on Harvard Business Review Blog on March 10, 2014, 52% of the people appreciate negative feedback. While reading this article, my thoughts went to retailers, restaurant owners, etc. (“business owners”) who are collecting feedback as well. Do they also prefer negative feedback? Or are they only looking for positive feedback that will bring new customers in return? My experience is that a lot of business owners are anxious to get reviewed and therefore don’t encourage customers not encouraging to give a review unless they are sure it’s good-excellent. In my opinion every review matters and especially the bad ratings are valuable. Every business owner should focus on customer experience. If a customer isn’t satisfied he should undertake prompt action. 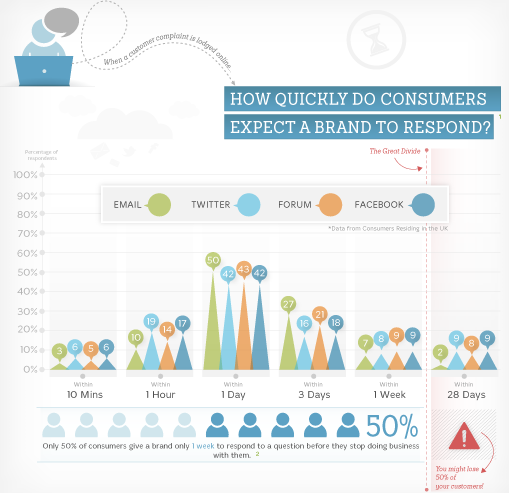 An infographic from KISSmetrics shows that even 13-25%* of the customers expect a response within 60 minutes! How fast should a customer service respond? Besides customers’ expectations, there is an another reason to respond quickly: Social Media! Most customers love to share their experiences & thoughts and they will definitely share their negative experience with you as well! #Fail at Twitter is a very popular hashtag word! Respond as soon as possible and keep in mind that customers are expecting the same as your employees: respect and being heard. Listen to your customers and match their expectations. 51% Will give a positive reaction in return. 22% Will post a positive comment about the organisation. So next time a business owner is in doubt whether to ask for feedback or not, he shouldn’t doubt but do! There is a lot to win! I wish you many happy customers!